An absolutely stunning looking M Sport X3 respendently finished in Space Grey Metallic with a contrasting Ivory White Nevada Leather upholstery and Brushed Aluminium Interior Trim. 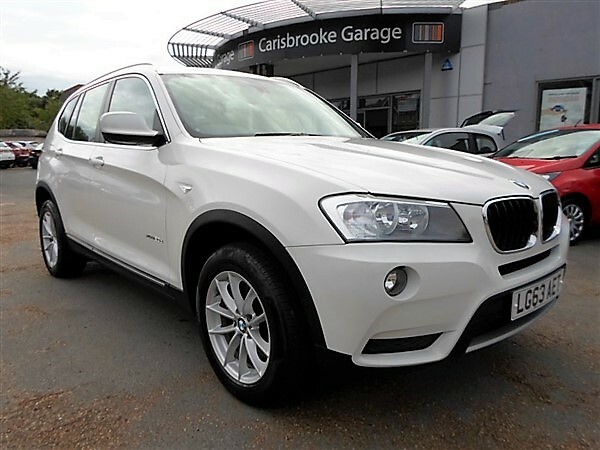 This SUV is powered by the proven and punchy 190 BHP, 2.0 Litre Turbo Diesel engine mated to the superb 8 Speed Automatic transmission providing 400 Nm of torque which equates to effortless performance with a healthy mid-range punch and excellent real world economy. As this is the M Sport model it is very nicely appointed and features * Automatic Tailgate Operation, * BMW Emergency Call & Teleservices, * iDrive Controller and Display w/6.5" Monitor, * Front/Rear Parking Distance Control, * DAB Digital Radio, * BMW Professional Radio/CD/MP3, * Rain Sensor Including Auto Headlights Activation, * M Aerodynamic Bodystyling, * Ambient Lighting, * Front Sports Seats, * Heated Front Seats, * M Leather Multifunction Steering Wheel, * Automatic Stability Control (ASC), * CBC - (Cornering Brake Control), * DSC-Dynamic Stability Control, * Hill Descent Control, * Hill Start Assist, * 19" Light Alloy Wheels - M Double Spoke Style. This vehicle emits 136 g/km CO2, costs £135 Per Year to tax, achieves 54.3 MPG (EC Combined) and falls into insurance group 31E. Fitted Extras data is provided by the relevant manufacturers, there is the possibility that a previous owner has changed these extras. Sixers Group provides the fitted extras in good faith but cannot guarantee or warrant the accuracy of any information supplied by 3rd party providers. We recommend that all buyers view the vehicles at our showrooms so that they can validate the specification of the vehicle and that it meets their specific requirements.